After having a feast in the Shivajinagar area and tasting delicacies like Sheekh kebabs, Phal and Quail, we moved to Frazer Town which is almost synonymous with Bangalore Ramzan. The White Mosque, which has a huge gathering for the Maghrib prayers, is the place we decided to start our food walk. 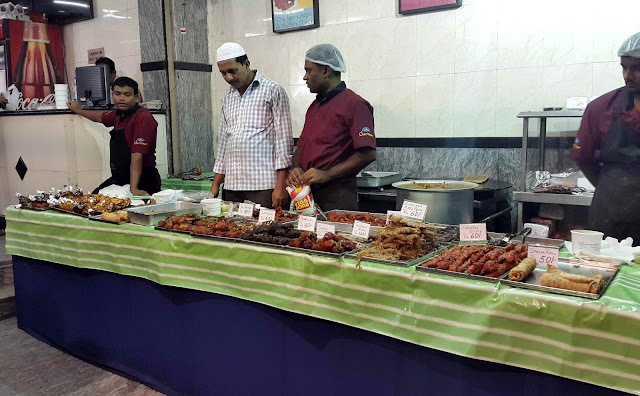 Located conveniently at the intersection of MM Road and Mosque Road, this area is fully occupied by food stalls, street food vendors and restaurants during Ramzan, all serving an assortment of iftar food including kebabs, samosas and biryani. Our first stop was at Chichaba's Taj, which is a short distance from the mosque intersection, along the MM Road. Decked with lights and multiple stalls in front, the famous restaurant was almost hidden amidst the decorations and could only be identified by their huge banner which advertised their Haleem. Like most of the places in Shivajinagar, Chichaba's Taj too remains closed for most part of the day during Ramzan and serviced food only starts for dinner. Chichaba's Taj, one of the most sought after restaurants in and around Frazer Town, had three separate stalls serving their wares. 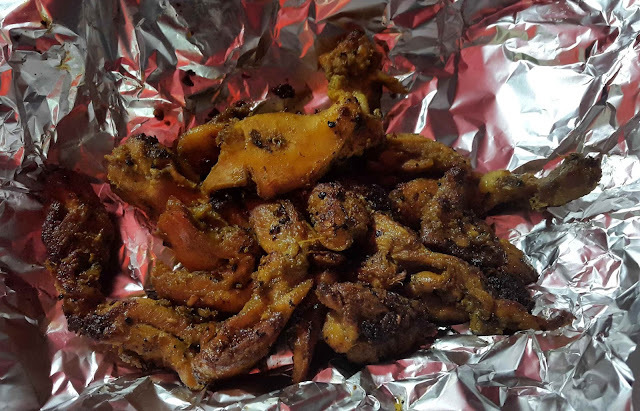 The first stall, which was right in front of their entrance, served kebabs and samosas of chicken and mutton variety. Though it was barely past sundown, the ferociousness with which the kebabs were getting consumed was quite alarming as I could already see a few empty casseroles. Their famous Burrah Kababs were already over. The second stall right next to the first one was that of Nihari and Haleem. 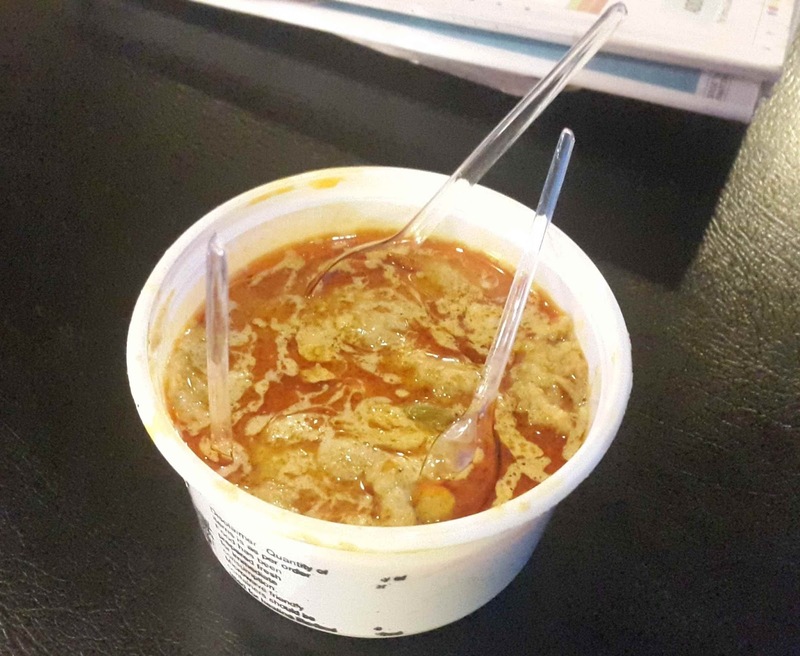 The Bangalore Haleem is a much more wheaty and bland version as compared to the Hyderabad one. Though the preparation is more or less similar, the spices are quite low and most of the taste of the Haleem comes from the Nihari sherwa which is added to it. The third stall was a bit far up, right beside the token counter, where a large group of people patiently waited to get to taste their Sheekh Kebab. Quite thick and large in size, the sheekh kebab was soft and meaty with no adulteration of any sort, much better but costlier than those that we got to eat at Shivajinagar. After Chichaba's Taj, our next stop was at Charminar Kebab Paradise which is on the other side of the mosque intersection on MM Road. 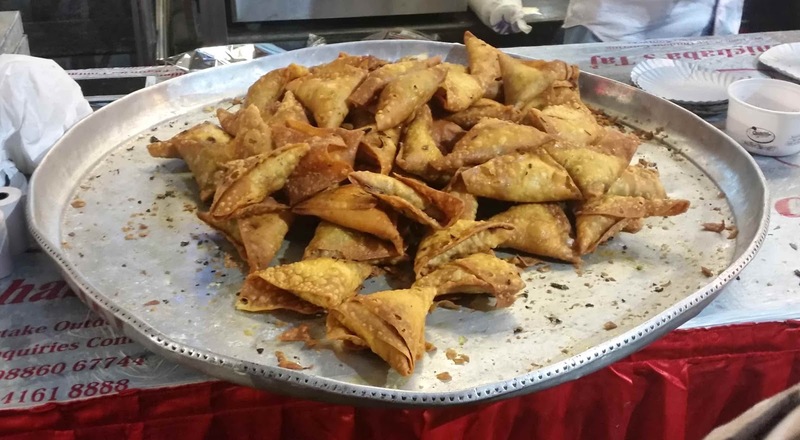 Charminar is famous for their fried food preparations like Baida Rotis, Paranthas and Samosas, which they make in both vegetarian and non-vegetarian variety. Albeit being too oily, their Baida Rotis are quite tasty with a good amount of chicken filling which is juicy and spicy. 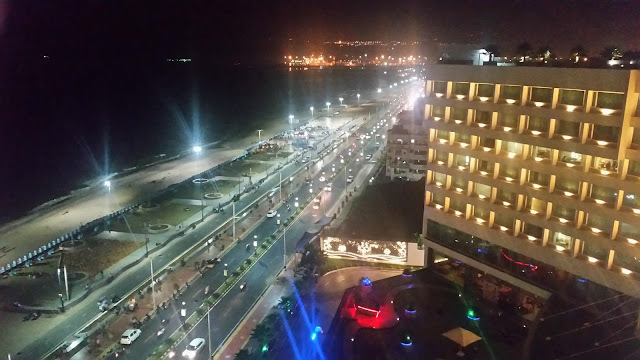 Other dishes worth trying here include their Mutton Kheema Paranthas and Chicken samosas. While munching on the sheekh kebabs at Chichaba's Taj, we were advised to try out the Quail Fry and Chicken Pahadi kebab at Rahhams. Though I had earlier tasted their mutton biryani at their Cunningham Road outlet, pahadi kebab was something I had missed. 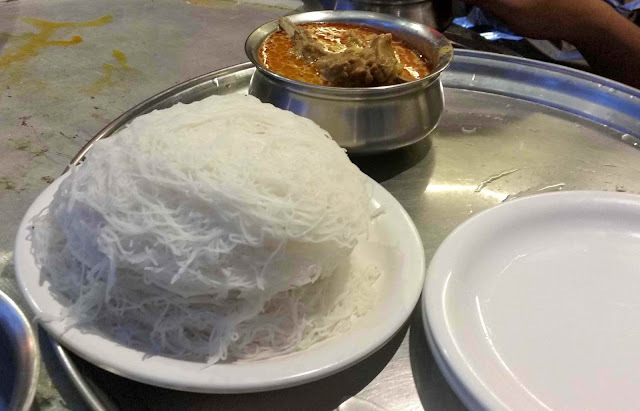 A short walk from Charminar Hotel led us straight to Rahhams. 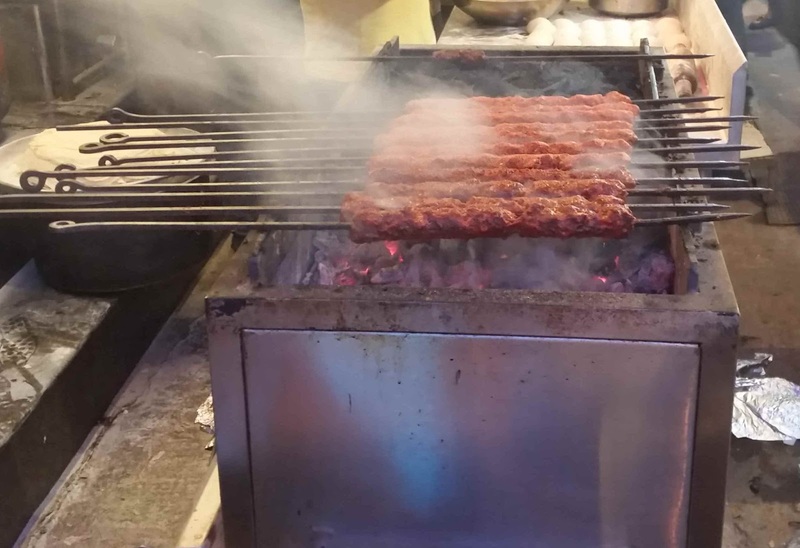 Like with most big restaurants, Rahhams had also set a small stall outside their main restaurant which sold shawarmas, while a huge crowd thronged their takeaway outlet which sold kebabs and biryanis. Unfortunately, by the time we made our way to Rahhams, Quail Fry, which is one of their most sought after delicacies was sold out and we had to make do with only Pahadi Kebab. The Pahadi Kebab preparation is quite different from the usual run of the mill tandoor kebabs that is available elsewhere. There is a strong flavour of fennel seeds and aniseed and is best eaten hot as they become chewy and hard when they turn cold. From Rahhams, we walked down the lane to New Taj, where Beef Pathhar ka Gosht was being cooked on stone slabs. 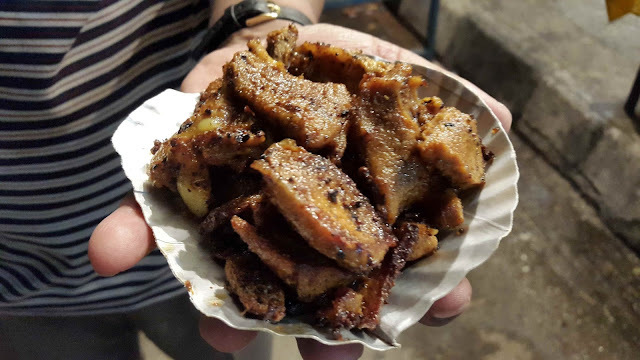 Generally a mutton preparation, the usage of beef changed the texture of the kebab quite drastically and isn't as soft as the ones that are usually available in Hyderabad. 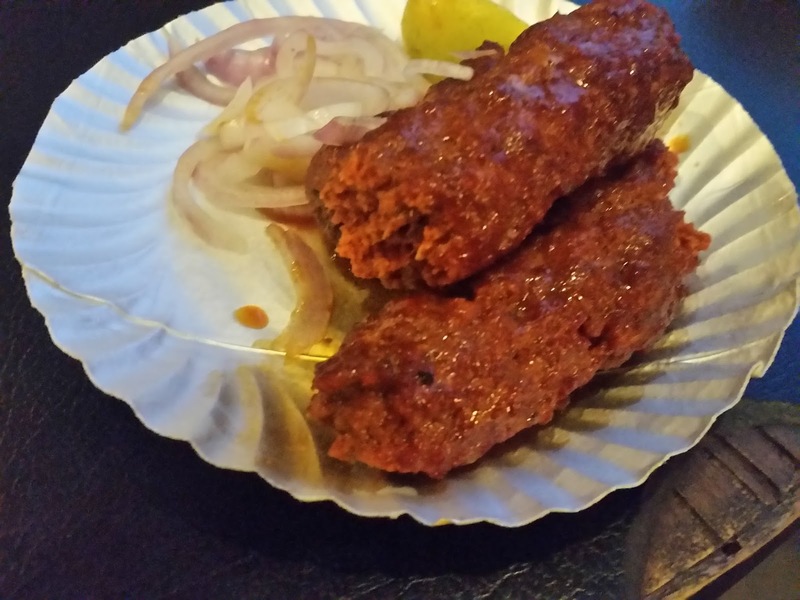 The marinade used here is different too but the rich masala made sure that the kebab was not short of taste. Right next to New Taj, near the intersection, is Alibaba. A small shop; there is a whole new variety of kebabs that was available here, from the generic Chicken kebabs to the Bangalorean Phal. 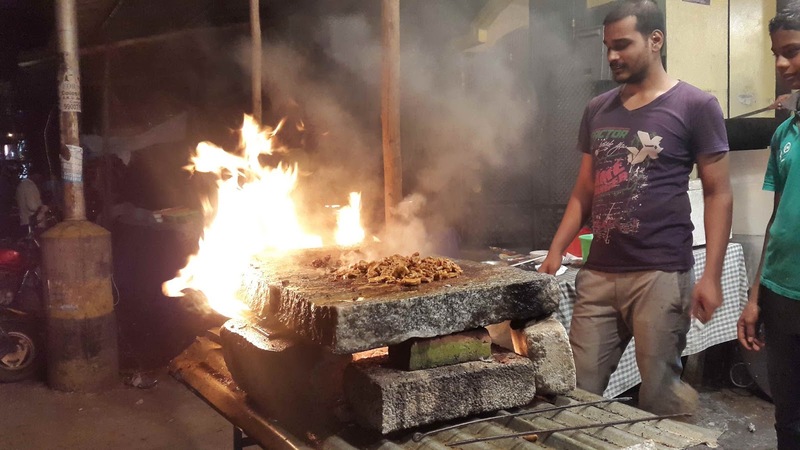 However, we were drawn to the kathi kebab preparations which were available in green, red and yellow marinades and were quietly being roasted on charcoal. From the chicken, mutton, beef and prawn varieties, we chose to go with the prawn one but one bite into it left us disappointed. Though they looked spicy, the taste was actually a bit sweetish and was present only in the coating. The meat inside neither had flavour nor taste. A bit disappointed, we chose to end our trip with our trusted Haleem provider Pista House of Hyderabad. 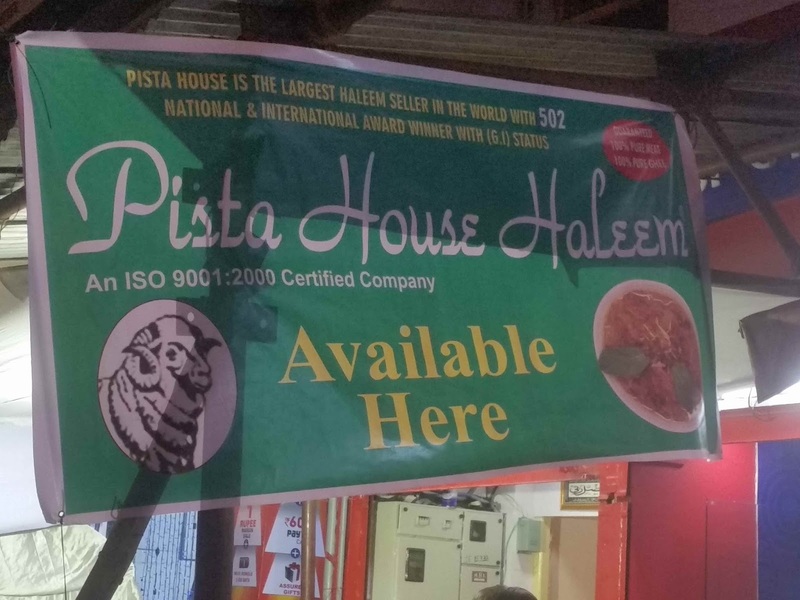 Pista House has quite revolutionized the Bangalore Haleem scene with multiple stalls throughout Frazer Town. They have also booked a function hall which serves as a takeaway counter for the haleem lovers. The Pista House Haleem in Bangalore is thick with good consistency but is a bit bland to suit the Bangalore palate. The quantity of meat in this was far greater than the Chichaba's Taj and a sprinkle of lemon made it truly enjoyable. While we did cover many shops around MM and Mosque Road, there are other restaurants like Zoya, Zaika, Siddique Kebab Centre and Albert Bakery which couldn't be covered due to limited stomach space. With so many kebabs, shawarmas and biryanis left to try, another trip is surely warranted to cover all of them. Chicken Samosas will be my favorite! !